Wrap a base of thread. Tie in a clump of marabou and a few strands of krystal flash. Tie in the estaz, then polar chenille, and then the schlappen (tie in by the tip) facing the rear of the hook. Tie in some rubber legs about 1/3 up the hook shank. Make wide wraps forward with the polar chenille. Tie in a some more rubber legs behind the cone. Wrap the schlappen forward. Try to trap as few fibers of the polar chenille as possible. Make a few extra wraps in front of the rubber legs, tight to the cone. Tie off and your finished. No go away winter so I can wade for smallies. Until then I will have to settle for catching their retarded lazy cousins in the local ponds. Nice fly Matt! Love the nice pics. Merry Christmas to all friends here at HATCHES!! Cool! I’ve been tying a similar pattern for jumbo flies for bass, leech for browns. Great catcher of fish. Great fly I tie them bigger for the monster Pike we have in Saskatchewan. They are very good for the trout here as well especially lake trout. 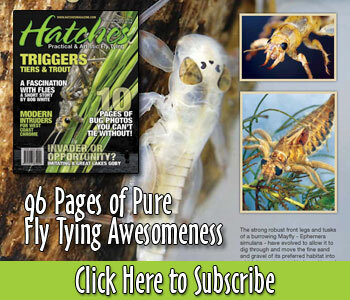 This will be a great spring and fall fly for trout, can’t wait to give it a try on the Missouri – A bugger with legs! Good idea. They work very well for Walleye in Saskatchewan also.